Today we’re sharing the perfect gift idea- a romantic Cuddle Kit for Two! A romantic Cuddle Kit is an amazing gift for your anniversary, your spouse’s birthday, Valentine’s Day, Christmas, OR just because! It would also make a cute wedding or bridal shower gift, or a quick-pick-me-up for a cold weather day. It can be thrown together in a jiffy, and who wouldn’t LOVE a night of cuddlin’, snugglin’, and lovin’ in a basket? 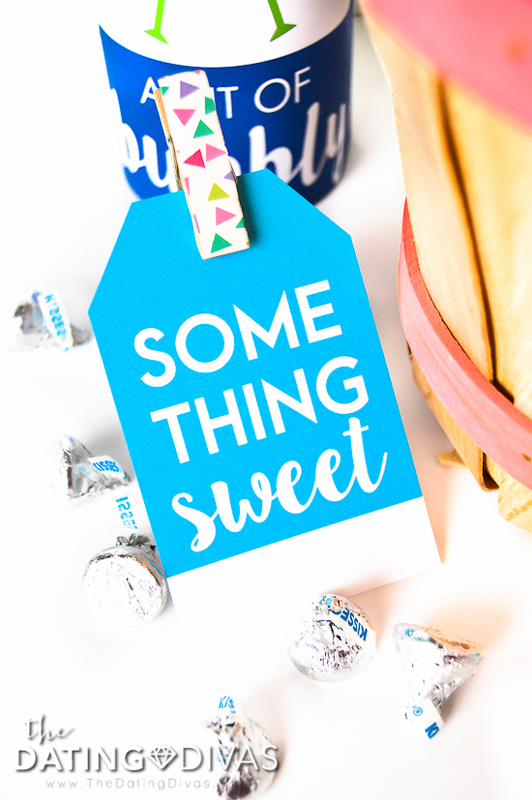 It’s quick, easy, AND romantic, plus, it comes with a darling, free printable gift tags and “Snuggle Up” banner to help you have the most romantic cuddle around. Doesn’t get much better than that! 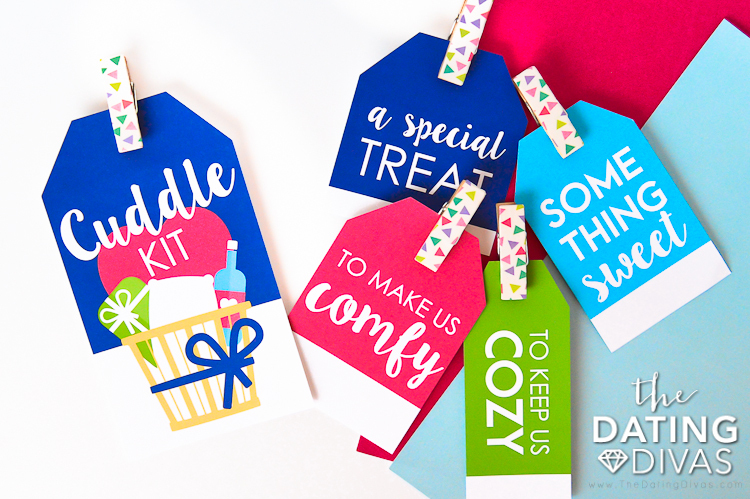 But before we jump into the coziness, we have to give a huge shoutout to Diva Elizabeth for creating such snuggle-worthy printables for us! We couldn’t have done it without her! 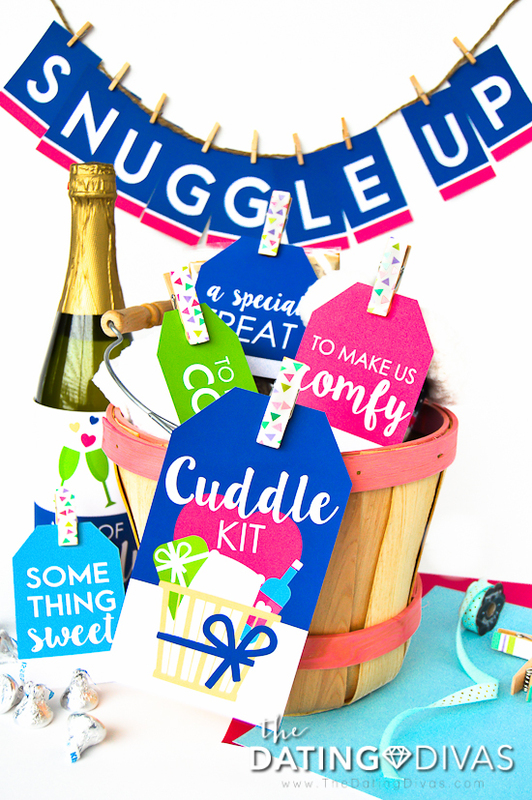 “Snuggle Up” Banner – This darling printable banner will add the perfect touch of coziness to your night of cuddling. Just print, cut, attach to some string or twine and you’re ready to roll! 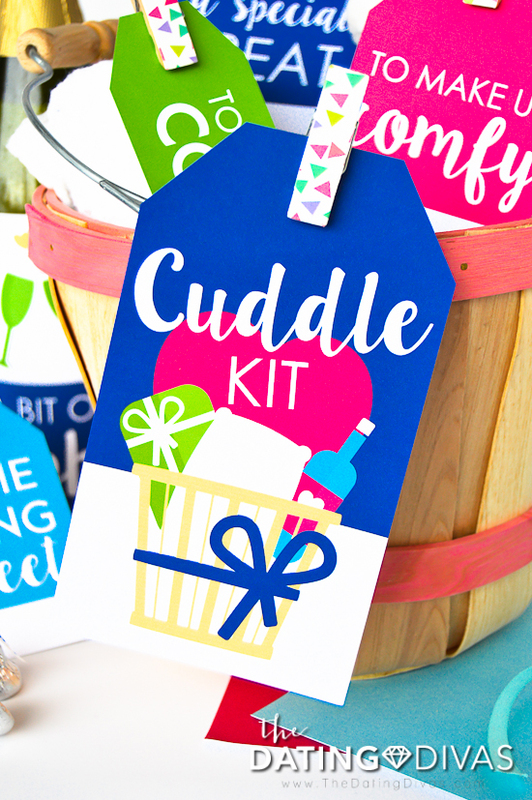 “Cuddle Kit” Tag – This larger tag goes on the OUTSIDE of your romantic Cuddle Kit and is so gosh darn cute, we can hardly stand it. Kit Item Tags – Attach these bad boys to your chosen kit items and prepare yourself for ultimate cuddle-faction. 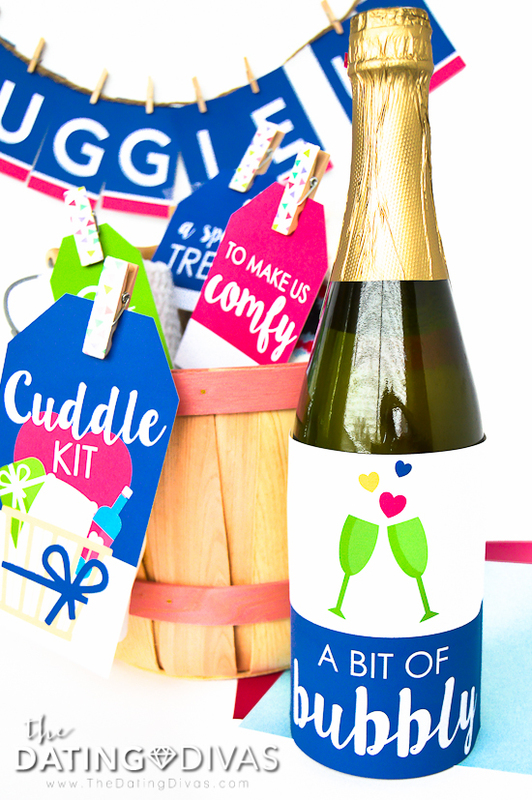 Bottle Label – Wrap this label around a bit of bubbly to complete your kit! Your kit includes four printable Kit Item Tags- plus a few blank ones if you want to come up with your own ideas. 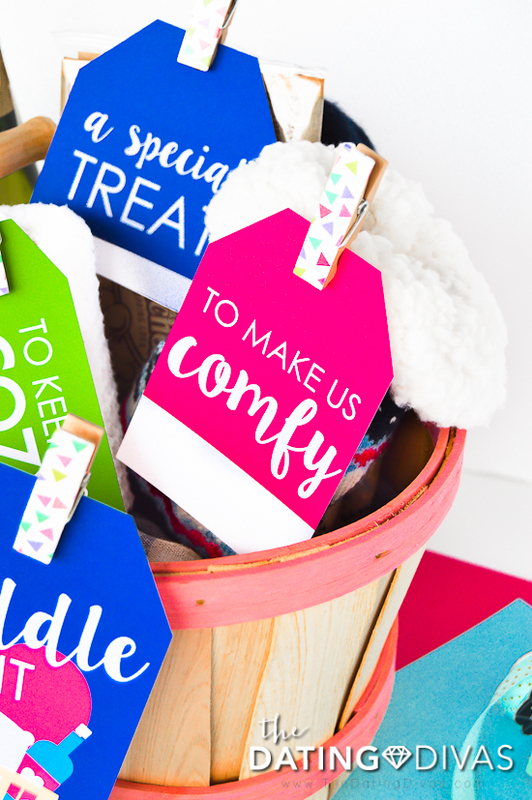 Each tag has a darling and oh-so-cozy phrase listed on it. Aren’t those fun?! 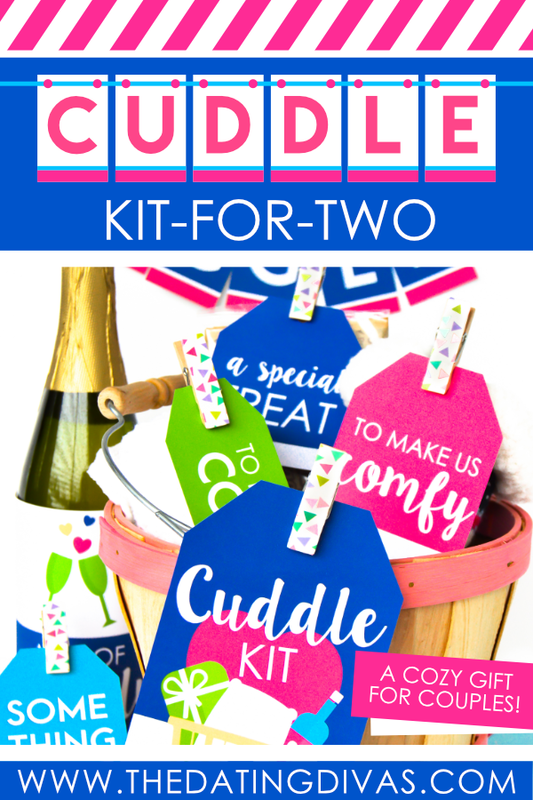 Yes indeed, this romantic Cuddle Kit takes quick and easy gift ideas to the next level, and we’re about to make it even easier! 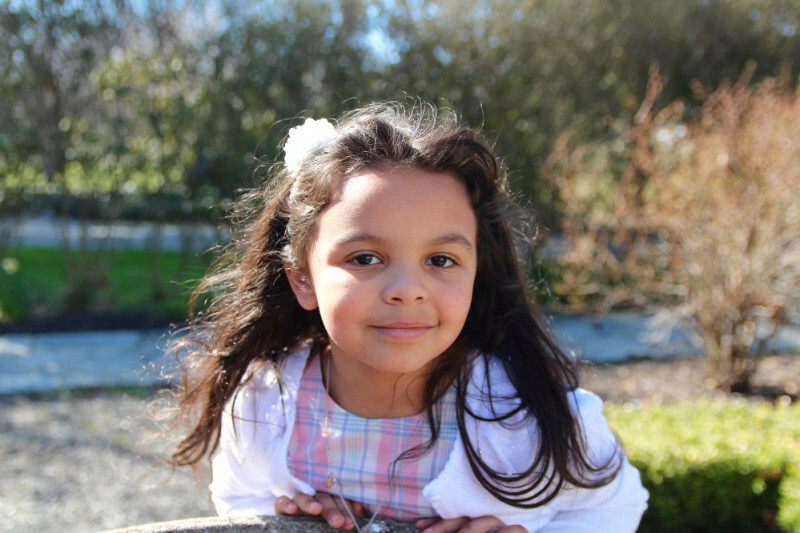 Keep reading for some ideas of inexpensive and easy-to-find items to include in your kit. The opportunities are literally endless! Just include whatever you think is comfy, cozy, and super cuddly. Don’t forget the bottle label for your bubbly! Simply print, cut, and affix to the front of whichever beverage you choose. The sparks (and snuggles!) will be flying in no time. Is that a quick and easy (not to mention FUN!) gift idea or what?! Go find a cute little basket and fill ‘er up today! Happy Snuggling!